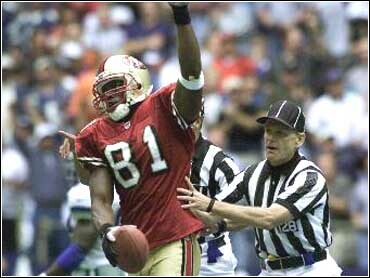 San Francisco receiver Terrell Owens was suspended for one game by San Francisco coach Steve Mariucci on Monday for his touchdown celebrations during the 49ers' victory at Dallas. After both of his touchdowns in the 41-24 victory Sunday, Owens sprinted to midfield and celebrated on the Cowboys' star logo. Mariucci said he spoke to the league office about his decision, and didn't know whether the league planned to level its own fine or suspension as well. "This decision is based on how we intend to conduct ourselves," Mariucci said. "It disturbs me when the integrity of the game is compromised in any way, shape or form." The second time Owens celebrated, Dallas safety George Teague followed him and leveled him at midfield. Teague was immediately ejected from the game. Owens is San Francisco's leading receiver with 23 catches for 328 yards and four touchdowns this season. He was also fined one week's salary $24,294. "I can't compromise our rules and values and the way we approach the game," Mariucci said. Mariucci said Owens' unrepentant attitude following his celebrations "didn't help." Though Owens apologized to his teammates after the game, he told reporters he didn't regret his actions, and would do it again. The victory was San Francisco's first in four games this season. Owens, told of the suspension Monday morning, apparently didn't take Mariucci's decision well. Team officials indicated that he left the team's Santa Clara headquarters in anger. Raiders receiver Andre Rison said he had dinner with Owens at a San Francisco restaurant Sunday night, and "we laughed about it," Rison said. "I think his teammates should have said, `OK, here comes the cavalry,"' Rison said. Rison said Owens knew he was going to be bashed by the media even after the first time he went to the star. "I don't think Terrell was wrong," he said. "Everybody has their own emotions." The Raiders play host to the 49ers on Oct. 8, the next game in which Owens will be allowed to play.